If you're like me and you read a lot of blogs and/or regularly updated sites frequently, there's a good chance you use Google Reader. And if you do, you're probably as hooked into it as I am. Well, to feed the addiction, I highly recommend Super Google Reader. 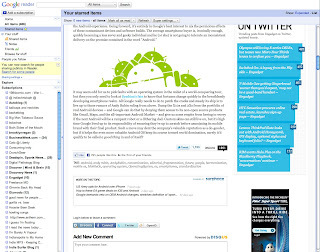 It's an extension for Chrome that allows for full viewing of feeds within Reader. After installing, the default is still the truncated view, but Super Google Reader gives you two other options right within the post: Readable and Link. Readable essentially gives the full text of the post, without ads, but may not work with all posts. Link gives you the entire page, graphics and comments included, within the feed--essentially running a tab or browser within the feed. Very slick and streamlined. You can find it here (on Chrome). I read this good and informative blog and I know This document provides information about and in support of the Department’s compliance with the law concerning Health and Safety aspects of the use of computers and display screen equipment, specifically the Health and Safety. So I said this is very use full post.